In June 1972, David Bowie released The Rise and Fall of Ziggy Stardust and the Spiders From Mars, the album that launched his most provocative, mercurial persona into the zeitgeist. When he landed in America later that year for a concert tour — his first-ever in the country — he not only introduced an intriguing realm of showmanship and spectacle, but also a shrewd display of public deception. While he’d earned critical acclaim and relative success in England, Bowie had yet to break the crucial (and lucrative) American market. Rather than building a fanbase from the ground up, though, he carried on as if he’d already assumed the status of a superstar. Acting out a ploy devised by his then-manager, Tony Defries, Bowie (along with an ever-growing entourage) traveled the States in style, reserving the finest hotel suites, riding in swanky automobiles, and essentially behaving like the crème de la crème. If he seemed a superstar, so the theory went, the public would thus perceive him as one. The scheme worked in places like the Northeast (especially New York) where his music and enigma had preceded him, but other regions, namely the South and Midwest, didn’t welcome this strange fascination with the same liberality. Concerts were canceled due to poor ticket sales while, on many an occasion, Bowie played before a few hundred fans rather than anticipated thousands. And so, when he reached California’s Santa Monica Civic Auditorium for two sold-out concerts on October 20 and 21, Bowie’s generous reception didn’t quite mirror those of the outing overall. Still, the first night’s performance — broadcasted live on Los Angeles radio station KMET with bootlegs circulating for years thereafter — stands as a representative and arguably the best document of the Ziggy Stardust tour. Officially issued by Virgin/EMI on July 22 in limited edition CD, 180 gram LP, and digital formats, Live Santa Monica ’72 remains an onslaught of rock ‘n’ roll abandon. Backed by the Spiders — Mick Ronson (guitar, vocals), Trevor Bolder (bass), Mick "Woody" Woodmansey (drums), and Mike Garson (piano) — Bowie (as Ziggy) commandeers a staggering set with savage ambition and swagger. Listening with retrospective insight reveals Bowie not just playing, but working songs — “Hang Onto Yourself,” “Suffragette City,” and “Moonage Daydream” foremost among them — and not out of some obligatory (or, as would happen over time, nostalgic) fulfillment, but because they subsumed his creative desire at that time. Even on non-Ziggy works, Bowie’s conviction pierces through, instigated in no small measure by Mick Ronson’s ingenious counterpart. The guitarist enriches songs like “Life On Mars?” and “The Supermen” with deft flourishes and footing. As Bowie delivers a cryptic vocal on the Jacques Brel song, “My Death,” Ronson intertwines an acoustic arrangement with feral ebb and flow. And on a ten-minute version of “Width of A Circle,” he suitably hijacks the song with seething distortion and electric fury. In the end, though, the stage belongs to Bowie has he careens through “Rock ‘N’ Roll Suicide” with his last shreds of temerity and composure, his voice trembling as if on the verge of collapse. As it is a bootleg, the recording has certain sonic flaws — the volume fluctuates and the mix is often muddled — yet the integrity of the performance is preserved and revelatory. 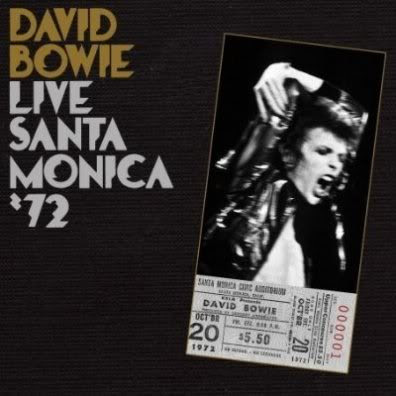 Live Santa Monica ’72 captures David Bowie going for the jugular with singular vision and drive, signaling his arrival as an emergent, innovative artist and, yes, a superstar.